Below: Gracilis looking great in this feature garden at Woodville North. Pleaching is the term used to trim off the leaves from the ground so the canes are exposed. They look fantastic – well done! 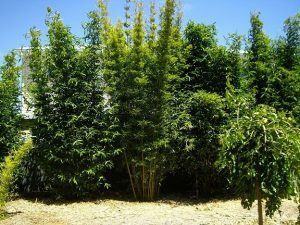 Gracilis is Australia’s most popular bamboo and grows so well in Adelaide. Inspired yet? Gracilis planted, and just 13 months later it’s hard to see the back fence! 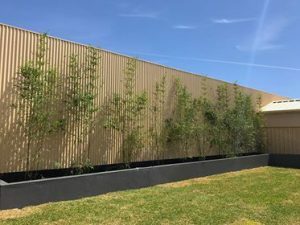 A perfect way to hide the neighbours and create a beautiful green living screen. These were a few of the first pics ever sent to us back in 2013, we wonder how it’s looking now. 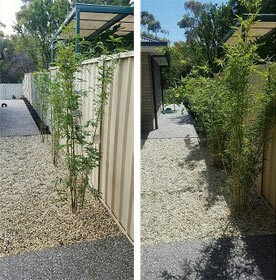 Ben from Adelaide has sent us these shots of his Gold Stripe Bamboo after it’s been in the ground just 8 MONTHS! 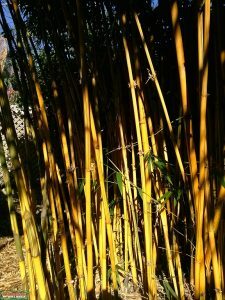 “Hi, thought I’d send in some pics of my bamboo progress. Last year you helped me with picking and caring for my bamboo, needless to say I’m pretty stoked so far with the results. The pics are of Gold stripe from July 2017 and then again today (March 2018). And the second photos are of Gracillis planted in May and then again today (March 18). Thanks for you’re help, won’t be long until I can trim and form a proper hedge. Cheers Ben”. 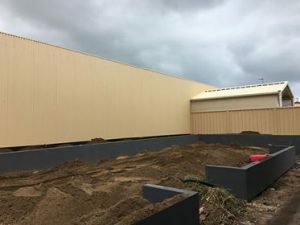 Looks beautiful and wow in a year or two, it will be lush jungle alright and will balance open lawn/concrete/bare fence areas. Fusca is a large variety of Gracilis and these are 1 year old! Margaret from Forestville is absolutely delighted at the effect so far. Have a look and see what they were like when first planted. In another year they will be close to covering the windows of the building next door. 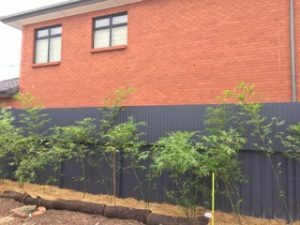 Fusca grows well in Adelaide and will grow to 2 storeys and Margaret’s looking forward to her living green wall. Gracilis (Slender Weavers Bamboo) in the middle, flanked by Alphonse Karr, these bamboo are creating an incredible green screen. Look at how the building next door is almost invisible. Alphonse Karr will grow 3-4 metres in Adelaide and both these varieties are perfect for our conditions. Thanks Hazel for sending in these photos. Fantastic! Comparison of Gold Stripe Bamboo in just 6 months. 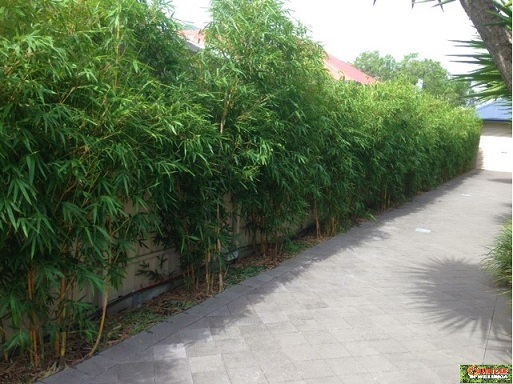 By the end of the year, Troy of Adelaide will be very happy to have the fence covered with lovely dense bamboo. Planted in August, this Gold Stripe Bamboo is already looking good in February, just 6 months later. As well as being a living green screen, the canes will also be a feature with their green and gold stripes. 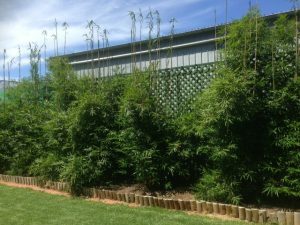 Grows to 3-4 metres in Adelaide. Vin and Velma from Edwardstown planted this Gracilis to hide their ugly shed. At the time they didn’t believe it when we said it would take about 12 months. Well, 10 months later this is the growth so far! They are delighted and excited to see how high and dense it will grow. 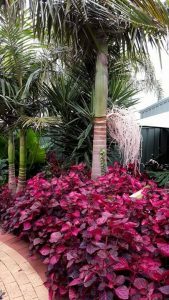 Jeff from Adelaide sent us in this pic of his Bangalow Palm flowering with Iresine making a splendid groundcover below. Funnily enough, we have the same combination here at the jungle and they look fantastic together. The bees have been loving the palm flowers lately. 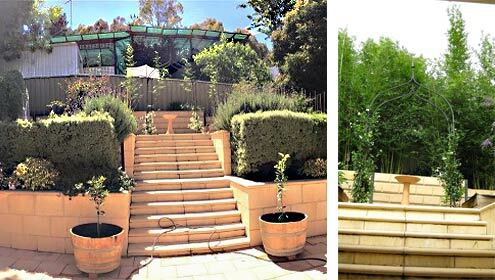 You won’t believe how Chris at Clarence Park has changed his driveway in just 10 MONTHS! It has been transformed and the fence and neighbours have well and truly disappeared. 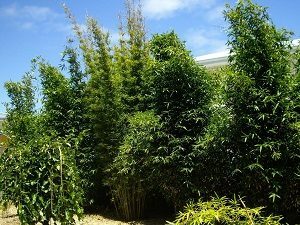 The bamboo is China Gold and is one of Australia’s most popular bamboo species, along with Bambusa gracilis and Álphonse Karr. Here it is on the day of planting 10 months ago and then 10 months later. 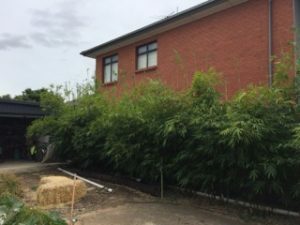 Check out what Zac has created at his home in Seaford….taking a very ordinary fence, he’s made a difference already by planting Gracilis bamboo. It won’t be long before you’ll be wondering what’s behind that green screen. We’ll keep you posted. Looks fantastic immediately….well done! 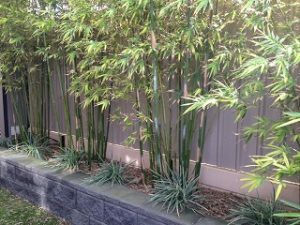 Tracey from Moana has planted Bamboo in a narrow garden bed to give the fence and her garden, a makeover. Then a ground cover grass, mulch and keep the water up. Well done, simple and elegant. 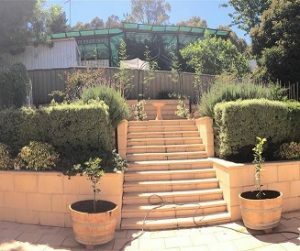 Keep sending them in folks – sales@jungleinwillunga.com.au. Thanks Hazel for sending in this photo. 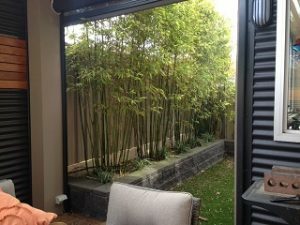 She has created an incredible green screen from a variety of Bamboos at her place. Look at how the building next door is almost invisible. 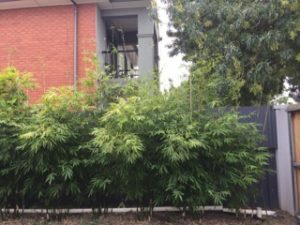 In the middle is Gracilis, flanked on either side by Alphonse Karr which will grow 3-4 metres in Adelaide. Fantastic! This photo comes from Christine at Mitchell Park, what a lovely tropical walkway she’s created. 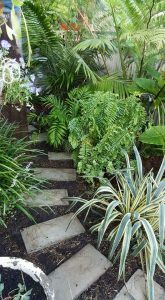 We love the way the solid pavers are offset by the soft ferns and palms. Beautiful! 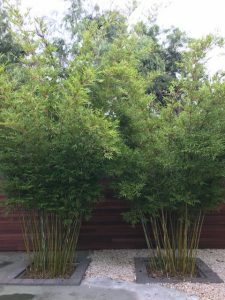 Thanks Steanes for sending us photos of your beautiful bamboo courtyard. 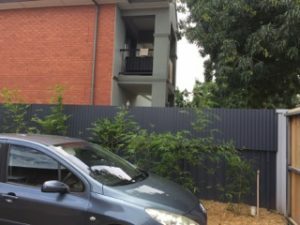 Using Gracilis to cover an otherwise boring, colourbond fence, this is what it looks like 13 months later: no more neighbours and a beautiful green screen. Take a look at it before. Love it! 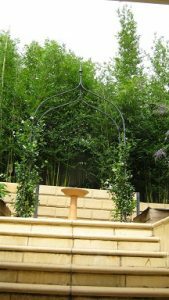 We would love to feature YOUR garden. Send in your photos and grace our front page.